fixpath is Gatelab's complete solution for buy-side dealer to sell-side broker interconnections via FIX standard protocols. fixpath helps brokers to receive orders from institutional and retail customers, then send the orders to other brokers and trading venues via a FIX connection or native API's. fixpath is designed to build a high-level brokerage business allowing for multiple exchange access and large volumes, with transparency and compliance adherence. Using traderpath, a buy-side institution trading desk can use the traderpath OMS to send orders to a broker via fixpath, that converts requests (and related responses) into the FIX format. At the opposite end, the sell-side firm (broker) receives the buy side orders via FIX messages, handled by fixpath, and feeds them into their traderpath EMS, so that they can be manipulated and/or automatically sent to the market. Notifications for requested operations will flow back to the buy-side institution by following the same FIX path. traderpath EMS is used to quickly and efficiently execute incoming customer orders using a variety of native orders, such as: care orders, basket orders, stop-loss, etc. 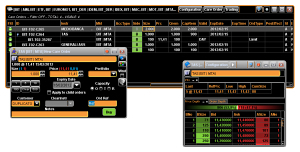 or via customized trading strategies created in algorithmicpath. and they can be quickly routed towards external destination markets or internally handled by sales, either manually (care orders) or via predefined algorithms. Both manual and automatic handling can partially or totally cross orders on an internal market, for systematic internalization, and send any remainder to external markets. The exchangepath framework, in conjunction with traderpath and fixpath, facilitates the creation of internal matching engines for systematic internalization or for proprietary multilateral trading facilities (MTFs), where bids and offers from operators and corporate customers meet (more info...).